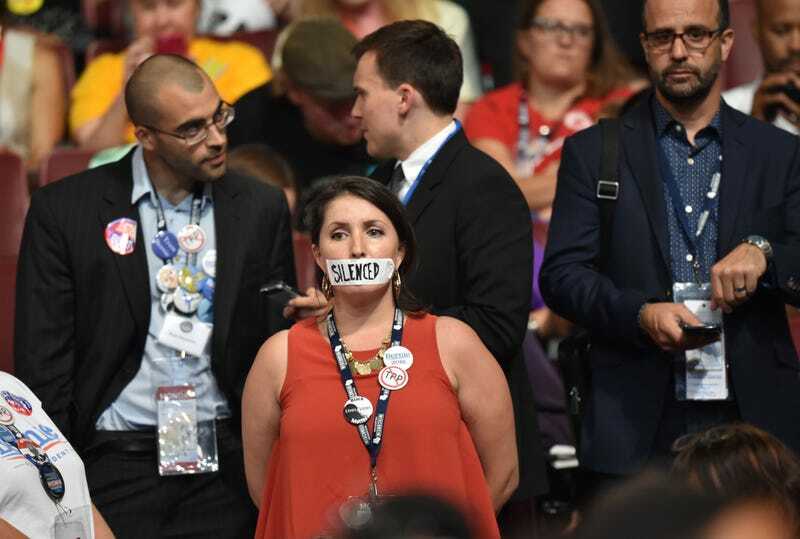 A supporter of former Democratic presidential candidate Bernie Sanders stands in silent protest during Day 1 of the Democratic National Convention at the Wells Fargo Center in Philadelphia July 25, 2016. As the Democratic National Convention gets underway, it’s always good to remember what Will Rogers once said: "I am not a member of any organized political party. I am a Democrat." And boy, those words have never rung more true than this year. Where the Republicans, when not running Donald Mussolini for president, are usually the neat and orderly ones, the Democrats are always the party of chaos, nervous Nellies and wacko craziness. It’s what they do. It’s who they are. But guess what, Democrats? Sure, there are thousands of “Feel the Bern” folks in Philadelphia, all of them wearing their red, white and blue capes because they’re super mad, but they were gonna be there anyway. And that’s OK. They should be mad. Hell, I’m mad. But here’s the reality. Then, of course, we have the Russians, our former “pinko Commie bastards” enemies who are now Donald Trump’s best friends forever, apparently hacking into the Democratic National Committee email server and leaking docs to Wikileaks about DNC staffers not being big fans of the guy who just decided to fill out his “I’m a Democrat” party card after eleventy billion years as the “socialist guy” who shouts at kids who stand on his lawn. But of course, being that the Democrats are tone-deaf to their own tone deafness, they decided to let Debbie Wasserman Schultz, the person the Bernie Sanders folks think put sour milk in Bernie’s favorite Ben & Jerry’s ice cream, step out in front of the microphone Monday morning and get shouted down. This, after she said she’d step down as head, but only after the convention. Fortunately, someone told Debbie that she might need to head back to Florida and not gavel in the convention like she defiantly thought she would. If I were her, I’d get to gettin’ on that primary election she’s gotta get through in late August. The combination of Bernie Bots and black folks not too happy that she’s in the pocket of the check-cashing, step-behind-the-red-line-at-150-percent-interest industry isn’t a great situation for an incumbent. All of this happened before the gavel struck, but I have one piece of advice for my fellow Democrats. We Democrats are your typical black family gathering at Thanksgiving, with the drunken uncles cursing out little kids about spilling their brown liquor; your aunt side-eyeing the new fiancee you brought for the first time, the one who can’t cook; and your grandmother having to raise her voice in order to “stop all this foolishness.” And yet, in the end, everyone eventually hugs it out, swears to God that they need to stop just meeting once a year, and the love returns. For the Democrats, the same thing will happen. But you just have to get through it. And there will be some cringeworthy moments. My God, if the Republican National Convention was nothing but a white supremacist rally in bad suits, the Democratic National Convention will be a white privilege expo. The arrogance of some Bernie folks who don’t completely understand how disastrous a Trump presidency would be to blacks, Latinos, Muslims, gays and lesbians, and the regular Joes and Janes of the world, will be very evident, and you’ll have to count to 10 when your Bernie-loving friends come up to you talking all that yang about TPP (the Trans-Pacific Partnership trade deal). But here’s the deal. Eventually the Bernie folks will move from the irrationality of anger and frustration to the rational thought process of “Holy crap, Batman! The Joker really is running for president!” The Clinton machine will get up and going, and Trump will be exposed more and more as a nutcase with a bad haircut. And in November, when it all matters, the chaos will slowly end, and the Democrats will pull the lever for the Democratic candidate, no matter how hard they grit their teeth. Because the alternative is unacceptable, even to unorganized Democrats.